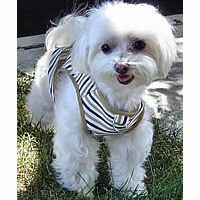 An adorable Striped Vest for small dogs that closes with velcro and a pinch clasp. You can earn 23 Golly Gear Rewards Points on this product! 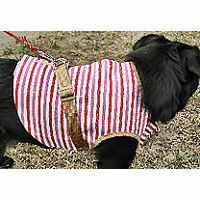 The Striped Vest is just right for your small dog at any time of year! It's sturdy but light-weight. You'll put each of your little dog's front legs through the proper openings, bring the harness up the sides and secure with the velcro strips. And it's secure with a buckle lock on the back with 2 leash rings over it (left). 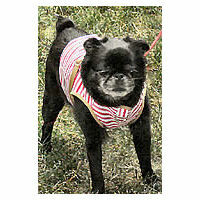 Plus, it's one of the cutest harnesses we've seen in quite a while! There's even a ring on a tab in front for your little one's ID Tag! 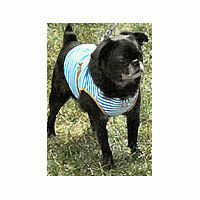 Roc (in Blue), Golly (in Pink) and Toto (in Tan) are enjoying a warm day wearing the new Striped Vest. 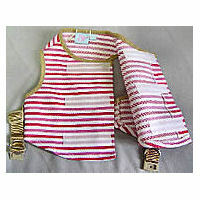 Made of 65% polyester, 35% cotton, the Striped Vest is machine washable in cold water. Here's a diagram showing where to measure your little dog (opens in a new window). Colors: choose Blue, Pink or Tan. 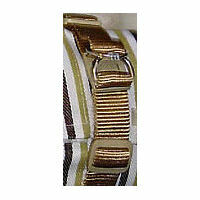 Each color is edged in tan at neck and legs, with adjustable tan webbing over the back for the buckled lock.